Benjamin Franklin wrote a series of fake news for his paper. The below is from an advice column he did. BF wrote both the letter and the response. I extract quotes from both. You must know I am a single Woman, and keep a Shop in this Town for a Livelyhood. There is a certain Neighbor of mine, who is really agreeable Company enough, and with whom I have had an Intimacy of some Time standing; But of late she makes her Visits so excessively often, and stays so very long every Visit, that I am tir’d out of all Patience. I have no Manner of time to my self; and you, who seem to be a wise Man, must needs be sensible that every Person has little Secrets and Privacies that are not proper to be expos’d even to the nearest Friend. Now, I cannot do the least Thing in the World, but she must know all about it; and it is a Wonder I have found an Opportunity to write you this Letter. Indeed, ‘tis well enough, as it happens, that she is come, to shorten this Complaint which I think is full long enough already, and probably would otherwise have been as long again. For my own Part, I have taken such a Fancy to this Turkish Custom, that for the future I shall put something like it in Practice. I have provided a Bottle of right French Brandy for the Men and Citron-Water for the Ladies. After I have treated with a Dram, and presented a Pinch of my best Snuff, I expect all Company will retire, and leave me to pursue my Studies for the Good of the Publick. He was 17 years old and was not allowed to write professionally. So he used a subterfuge and invented “Mrs. Silence Dogood”, a middle-aged widow. That's how Benjamin Franklin became the first “Dear Abby” in US history. 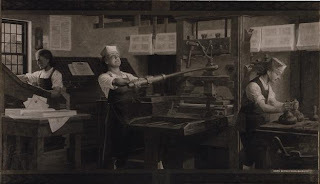 Pictured: Benjamin Franklin at his regular day job, working in the printing office. Um, I think it was Mrs. Silence Dogood (a play on Do Good) rather than Dogwood. At any rate, quite a show of wit, wisdom, humor, and intelligence for the teenage Franklin! I just looked it up and you're right. I corrected the article. Thank you!